Every goddamn day: 04/18/19: Traitor Week #5: Julius and Ethel Rosenberg—"A society which does not defend itself is not worthy of survival." Traitor Week #5: Julius and Ethel Rosenberg—"A society which does not defend itself is not worthy of survival." Now that betrayal of our country has practically become a Republican folk illness—79 percent approve of Donald Trump's disgraceful genuflection to Vladimir Putin this week—it might be the right moment to remind ourselves that liberals have done their share of traitor-coddling, once upon a time. 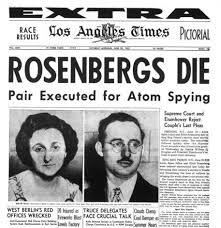 Remember the Rosenbergs,. Julius and Ethel. A married couple in their mid-30s, accused of passing atomic secrets to the Soviets . Julius had worked in a sensitive Army job during World War II; Ethel enlisted her brother who worked at Los Alamos. During their trial, and for decades after, the Left was enthralled by the notion that the Rosenbergs were innocent, victims of a police state trying to squash dissent. The couple had either been set up, or were being persecuted for non-crimes. Writers such as Nelson Algren, scientists like Albert Einstein, world celebrities like Picasso, all spoke out in defense of the Rosenbergs. Sartre compared the case to the Dreyfus affair—the Rosenbergs were Jewish. Which didn't stop the pope from appealing to Eisenhower for clemency. In calling for the death penalty, U.S. Attorney Irving Saypol said, "A society which does not defend itself is not worthy of survival." Common wisdom is that Ethel was a bit player, condemned to encourage Julius to tell all he knew. It didn't work. "She called our bluff," a prosecutor later reflected. Those caught up in the Trump campaign collusion with the Russians should not forget Ethel Rosenberg. They might cling to the notion that whatever role they played was small they'd somehow escape notice. Ethel's low level of involvement didn't matter when the switch was thrown. ''When you're dealing with a conspiracy, you don't have to be the kingpin," said James Kilshiemer, a prosecutor who built the case against the Rosenbergs. "You have to participate,."' Treason is like pregnancy; you can't do it a little. The couple died in the electric chair at New York's Sing Sing prison on June 19, 1953. After the fall of the Soviet Union, classified documents came to light showing that not only did the Rosenbergs conduct espionage, but recruited other spies to join them. "While the transcriptions seemed inconclusive, they forced me to accept the possibility that my father had participated in an illegal and covert effort to help the Soviet Union defeat the Nazis,''wrote his son Robert Meeropol who defended his parents for years. A reminder: no matter how damning the evidence against any traitor, there will always be defenders. A 79 percent approval rating of Trump kowtowing to Putin means that no amount of proof will be enough to shake his support. We might as well get used to that now. I don't think the Rosenbergs were innocent, but I do think that condemning them to death was way out of proportion to their offense. I'd think that even if I believed that the death penalty was appropriate in other circumstances (which I don't). It's questionable, after all, just how much--if at all--the information they provided helped the Soviets develop the atom bomb. And while there's no way that question could have been answered at the time, if you're going to kill someone for "giving the Russians the bomb," you need to be sure that that's in fact what they did. Yeah, the guy who should have been executed was Klaus Fuchs. He spent nine years in prison, and after that, he relocated to East Germany, and help China develop their bomb. Talleyrand supposedly said that whether you come out a traitor or a hero depends on the dates. And he was an expert in both categories. Yes but Meerepol was defending his loving parents whom he was traumatically orphaned by as a child and whom he was long told were innocent , so his inability to accept the truth about those parents is at least understandable. What excuse do the Trump supporters have? Have you watched Ivy Meeropol's Heir to an Execution. It's a fascinating documentary from Julius and Ethel's granddaughter and while certainly biased and pro Rosenbergs it gives you a real eye into what it was like for their family to be faced with the truth.